The little fishing village of Isola Rossa lies in the north of Sardinia between Costa Paradiso and Castelsardo. It is characterised by a defense tower built on a small promontory in 1565 when the Spanish were in power. Walking around this area, with its turquoise sea and rust-coloured rocks, is a real feast for the eyes. The surrounding cliffs and coves add to the beauty of this place. Cala Tinnara, between the village of Costa Paradiso and Punta Li Canneddi, near Red Island, is a peaceful and colourful cove. The white-gold sand of this this secluded beach accentuates the emerald and turquoise colours of the sea. The Riu Pirastru river runs down to the beach through richly aromatic vegetation. DAY 3: Transfer to Costa Paradiso - Walk up to Portobello - Return transfer to Santa Teresa di Gallura. Time to relax and Shop. 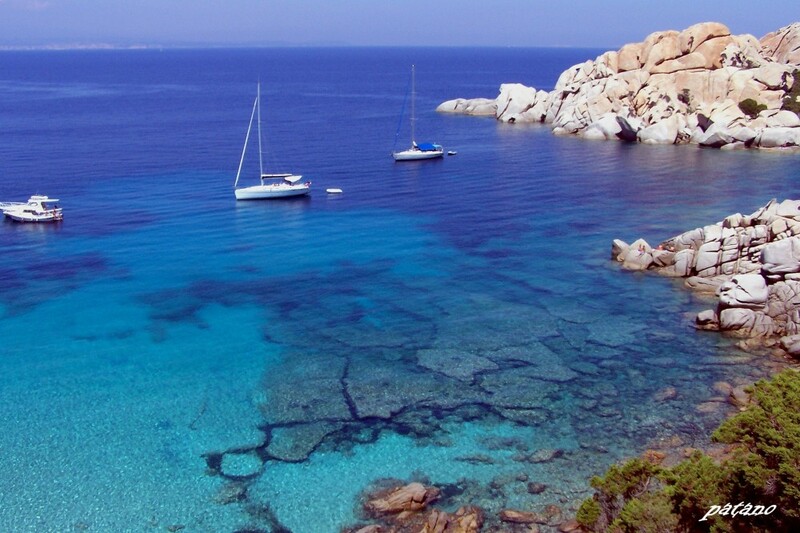 While Porto Bello is surrounded by beautiful beaches and a wild and romantic landscape, Santa Teresa Gallura, in the north of Sardinia, rises up on a promontory above the sea as though in salute to its neighbouring island, Corsica. The Strait of Bonifacio separates the two. In Roman times, Santa Teresa was a major centre for the Sardinian granite trade. 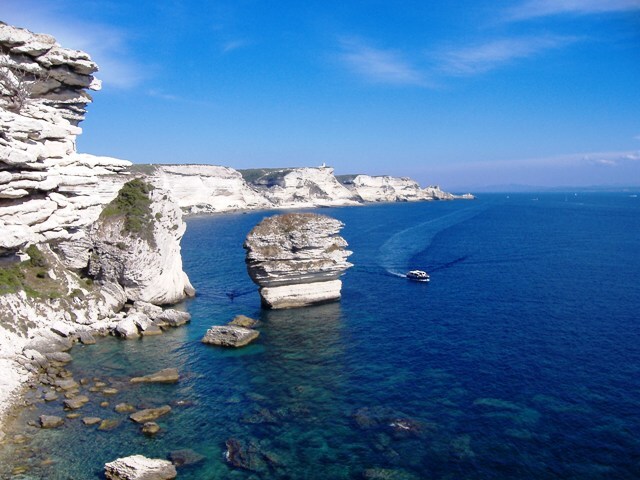 Bonifacio offers you a unique view. The fortified town with its medieval alleyways lies high above limestone cliffs. Our cliff-top walk takes you to the lighthouse and further east to the superb beach at Cap Pertusato Ciappili. 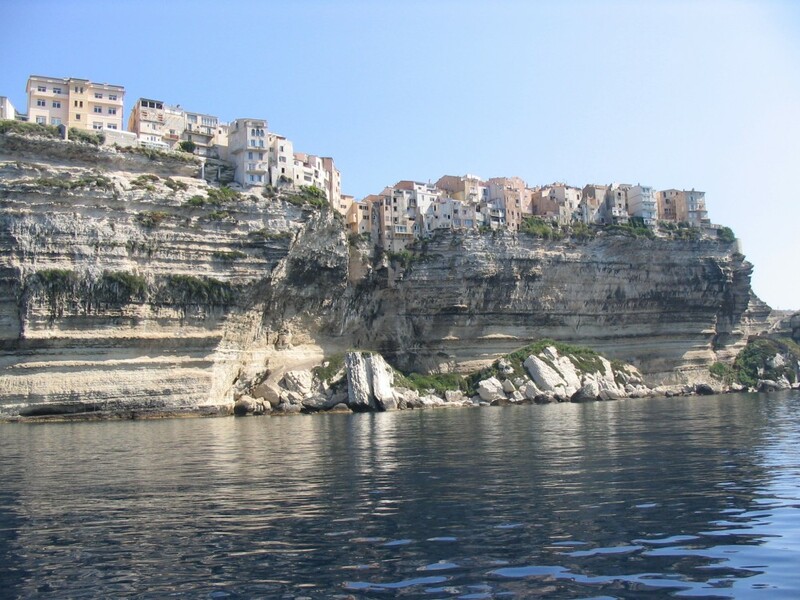 From Bonifacio, we take the boat back to Santa Teresa di Gallura. DAY 5: Walk from the hotel to Rena Bianca , past the military area to Capo Testa Bridge and the lighthouse. Explore the beach area. 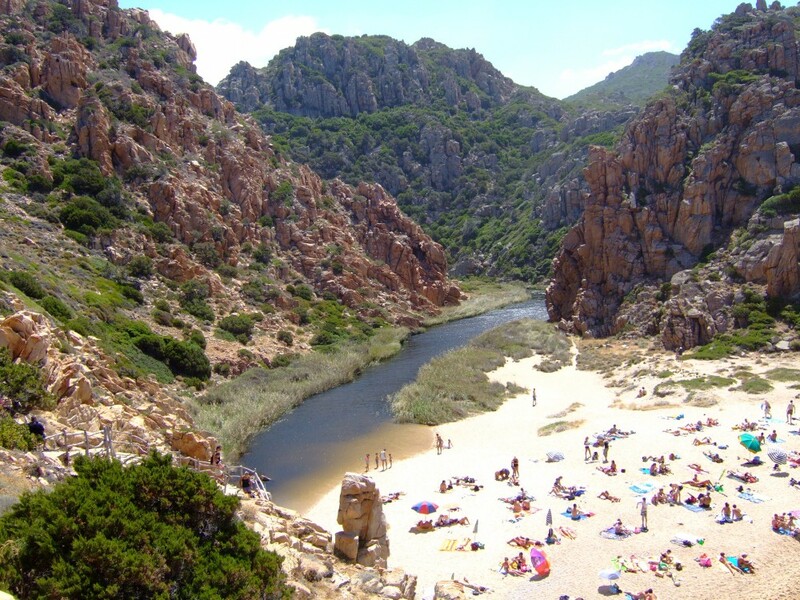 Rena Bianca is a white sandy beach in the coastal resort of Portisco in the Olbia region. An explosion of colours makes this an idyllic setting. The sand dunes, rocks that are sometimes pink, sometimes red, the green of the scrubland: the colours stand out against the startlingly clear water. 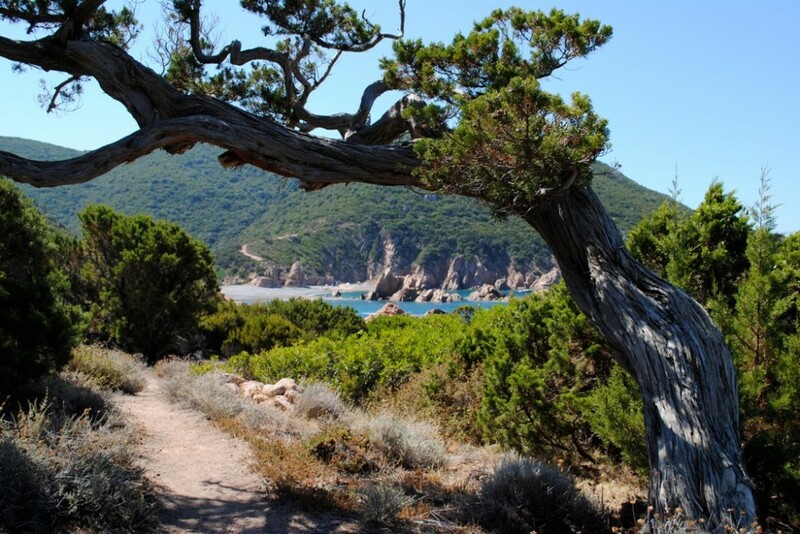 Our walk continues to the Capotesta Peninsula, several kilometres from Santa Teresa di Gallura. Looking out over the Strait of Bonifacio, the Cape is characterised by its granite rocks, typical of La Gallura and eroded by the sea winds, and by the two beaches which link it to the mainland. From their granite peaks, Sant’Andrea, Pelchia Manna and Melchia Minor loom over the village of San Panteleo. 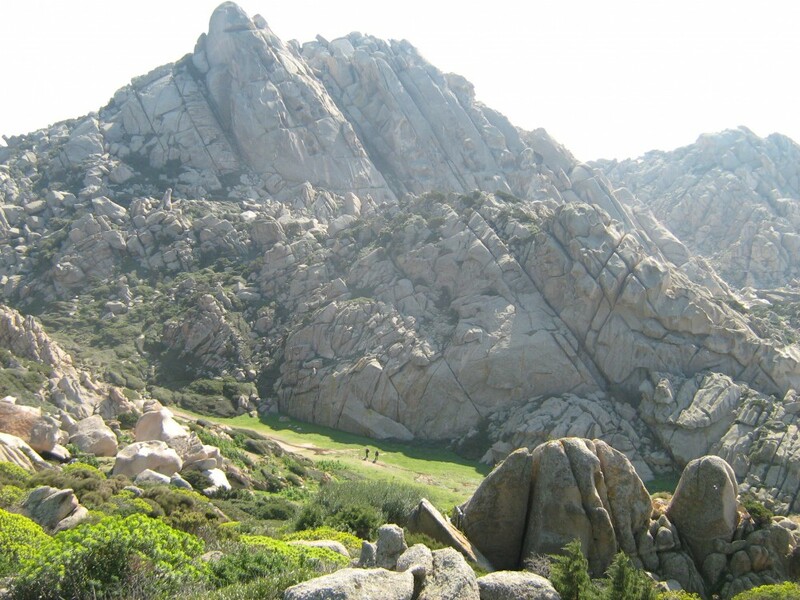 Deep in the heart of La Gallura, shepherds and hunters used to find shelter in the caves inside the imposing rocks. Our itinerary takes us through the scrubland and green oak trees towards the slopes of Punta Cugnana. The view from the summit is one of the most majestic, taking in Tavolara Island, Capo Figari, the Costa Smerelda and the famous archipelago of La Maddalena. Walk from the Hotel to Rena Bianca beach. Our last walk takes you along a succession of superb beaches near San Pantaleo and a chance to take your fill of the beautiful Mediterranean colours on offer. ♦ Transfer from the airport of Alghero and transfer back to the airport of Olbia.